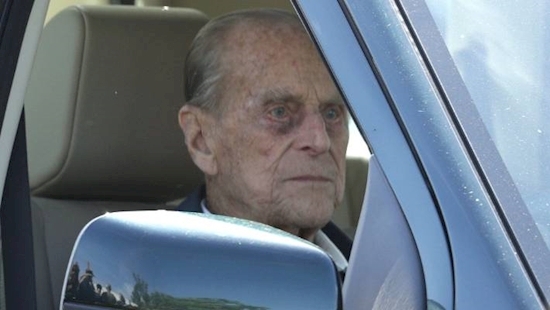 After Prince Philip's Prince dramatic crash with a car carrying two women and a baby, it has been revealed why members of the royal family almost never wear their seatbelts. The 97-year-old royal's refusal to belt up made headlines. Two days after the duke was involved in the crash police gave him a warning when he was photographed driving in another vehicle without a seat belt. British news outlets published a photo of him behind the wheel of a Land Rover outside the Sandringham Estate, a private property of the royal family in Norfolk, eastern England. The same day the Queen was similarly photographed driving without a seat belt in sight. After his collision Buckingham Palace said the Duke of Edinburgh does have a valid driver's license. However it seems his wife, the Queen, does not. It turns out the monarch never got her driver's licence. Land Rovers which are supplied to royals have their seatbelt alarms turned off to make it easier to drive without one, it was claimed. A source told The Sun that Jaguar Land Rover was instructed to disable the seatbelt alarm on vehicles supplied to the royals. They went on: "It's so that the driver doesn't have the continuous warning beeps if they don't wear a seatbelt." It is not illegal to disable the seatbelt warning feature, but it is mandatory to wear seatbelts under UK law unless a doctor provides a medical exemption. Former royal protection officer Simon Morgan has offered one particular reason the Windsors often skip buckling up. According to Hello! magazine Morgan said appearance would be factored into whether a royal wore a belt. "What is significant about this event or situation? Is an individual's look and appearance important?" he told the British magazine. "Protection is a very unique area of policing and there are a lot grey areas, but you are always judging each situation to weigh up the risks and threats with the outcomes you are trying to achieve." It seems seatbelts crease their clothes. Morgan also said sometimes the royals travel seatbelt-free for safety reasons, that is, so they could be whisked out the vehicle if there was a security threat.